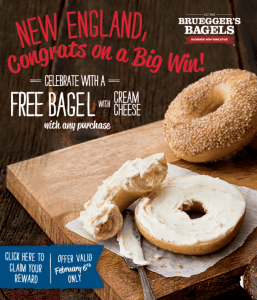 Bruegger’s Bagels is celebrating the Patriots Win with Free Bagel! Bruegger’s Bagels is celebrating the BIG WIN with a free bagel with cream cheese TODAY, February 6, 2017 only! You do need to fill out this quick form to get a coupon to take advantage of this offer at participating locations only. For more information or to request your free bagel, please head here.